(Left to right:) Mary Elizabeth Scallen, Leonard C. Haas, Peter DeLaurier, Marcia Saunders, and Stephen Novelli in "For Peter Pan on Her 70th Birthday," through May 12 at People's Light in Malvern. The creation story of Sarah Ruhl’s For Peter Pan on her 70th Birthday is charming. A MacArthur Fellow and two-time Pulitzer finalist, Ruhl wrote the play as a birthday gift for her mother, who had played Peter Pan at the Davenport Children’s Theater in Iowa. The remaining characters — five siblings in all, plus their father — are fictional composites of the maternal branch of Ruhl’s family, the Irish Catholic Kehoes. Set in the Clinton era and the world of the imagination, the play draws on actual domestic stories, jokes, and political debates too gentle to drive otherwise loving relatives apart. With snippets of prayers and song, the play is, in fact, gentle to a fault — an intermittently comedic homage to family and memory and the magic of theater. Devoid of significant conflict, it’s less a drama than a meditation on mortality and the meaning of adulthood. One could nevertheless imagine a more stirring production. The People’s Light staging, helmed by the company’s executive artistic director, Abigail Adams, is amusing at times, but something of a slog, even at a scant 80 minutes. Like the adults mired in Ruhl’s deconstruction of J.M. Barrie’s mythic tale, it penetrates no emotional depths and never really takes flight. A prologue features Ann (Marcia Saunders) recollecting her teenage turn as Peter Pan, including a thrilling encounter with Mary Martin (Broadway’s Peter Pan). Then the curtain rises on a familiarly painful scene: a family (in this case, three sons and two daughters) keeping vigil around a hospital bed, where the patriarch lies dying and machines register the last vestiges of life. Awaiting the inevitable, the siblings complete a crossword, watch football and family movies, exchange memories, and debate just how much morphine to administer. The next scene — Ruhl calls them “movements,” as though the play itself were a symphony — is an Irish wake, with the family now gathered around a dining room table (the literal set design is by Tony Cisek, with lighting by Dennis Parichy). Amid jokes and the imbibing of Jameson’s whiskey, Ruhl delineates the mildest of family rifts and resentments. Jim (Peter DeLaurier), a cancer surgeon, bemoans “political correctness” and his sisters’ liberalism. “Liberals believe in unreal worlds — Neverland, if you will — and conservatives are pragmatists who try to solve problems on the ground,” he declares. Meanwhile, the children’s father (Graham Smith) matter-of-factly reappears, a ghost still haunting them. The third movement begins in the nursery of Wendy (Mary Elizabeth Scallen), Michael (an endearing Leonard C. Haas) and John (Stephen Novelli) — at once earthbound adults and characters in a long-ago play. An aging Ann, as Peter, gamely attempts to climb through their window. (For some reason, costume designer Marla J. Jurglanis deprives her of the requisite green tights.) 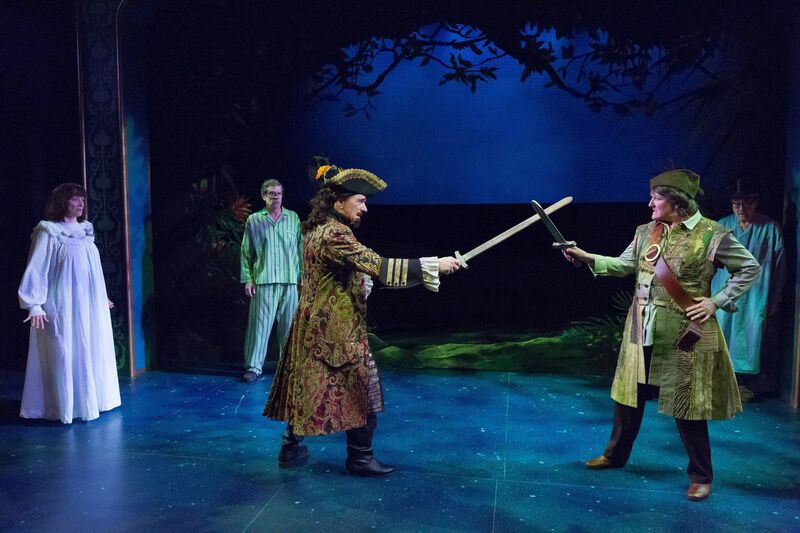 The siblings march to a children’s theater version of Neverland, complete with Captain Hook (DeLaurier), deliberately stagey fight choreography, and various failed attempts at flight. Among those returned to life in For Peter Pan is the family dog. Played on opening night by a hound named Reg Adams, the dog is very good, even taking a well-deserved bow at the end with the rest of the ensemble.